Welcome to our portrait, in imagery and sound, of a refugee community. This presentation accompanies Wendy James’ study of how Sudan’s civil wars have affected just one among many minority groups who have lived through loss and displacement. You are invited to enter a series of eight clusters of video clips which illustrate the memory rich landscape of Bonga, one of several refugee settlements in Ethiopia where displaced Sudanese sought safety and assistance over the last two generations. To view the video clips, you will need a broadband connection and Flash 8 player. There are also a few audio clips which require a quicktime player. In the 1960s, I was teaching social anthropology in the University of Khartoum, Sudan. I had the opportunity to study the languages and ways of life of a number of minority peoples living close to the Ethiopian border. In particular, I lived for a total of about 18 months among the Uduk people of the Kurmuk District of the Blue Nile Province. The Uduk, and some of their neighbours, already poised on the frontier with Ethiopia, found themselves caught between ‘north’ and ‘south’ of the Sudan during the internal struggles of that country, especially the civil war stemming from the south which resumed in 1983. Some people I knew were drawn into the defence of their country, and some into supporting the armed opposition of the Sudan People’s Liberation Movement/Army (SPLM/A). The civilian majority were displaced from their homeland near Chali, and nearly all their villages burned by Sudanese army and militias, in 1987. After years of trekking this way and that, they eventually found a ‘safe haven’ in 1993 at the Bonga refugee scheme in Ethiopia. After the peace agreement of 2005 between Khartoum and the SPLA (though the war in the western region of Darfur continues), repatriation of Sudanese refugees from Ethiopia began in 2006 and is planned to continue through 2007-8. For further details, see the following: MAPS & FURTHER READING, AUDIO SONGS and PHOTOS. 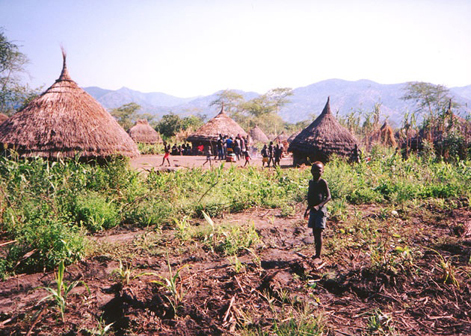 Over the years I have had several chances to make contact again with the Uduk people in various places of exile. Despite great suffering on their long treks, I have been struck by the way that they have shown resilience and been able to re-create something of their material practices, their music and their song, in the refugee settlement. A full story is offered in my book, illustrated above, War and Survival in Sudan’s Frontierlands: Voices from the Blue Nile (Oxford University Press, 2007; ISBN 978-0-19-929867-9). This website does not examine the wars or causes of wars in the region, nor the details of the refugees’ experiences over the six years of repeated displacement. It focuses, rather, on their resilience and optimism. The presentation here is made in collaboration with Judith Aston, multimedia specialist at the University of the West of England. Our special focus is on the way that the rhythms of everyday work interweave and resonate with those of music, song, and dance, together forming a new setting in the refugee settlement for the making, and sharing, of memory. Robert Gordon for compiling this site and without whom none of this would have been possible. All those who appear in the video clips on this site, and those who have helped with translation (full acknowledgements and details of interviews may be found in Wendy’s published books and papers).